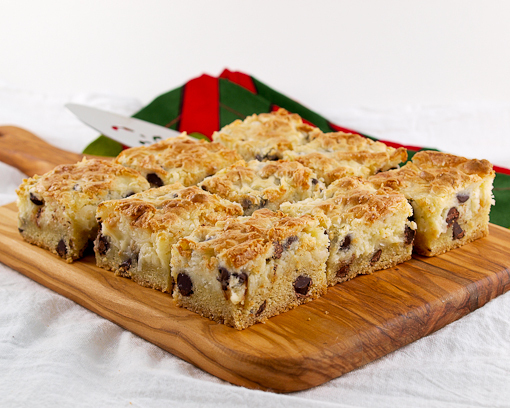 I was kind of half joking on Twitter when I said that I would call these ‘Awesome Bars’. It turns out they are really quite awesome so I felt no qualms about adding it to the title. So, what are ‘Awesome Bars,’ you might ask?. 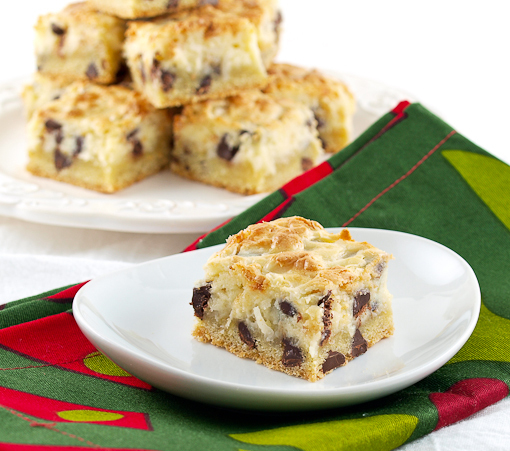 Well, they are a dense, buttery cake bottom with a VERY rich cream cheese topping loaded with coconut, chocolate chips, and some crisp rice cereal. The cereal does not really add any texture as far as I can tell, but it adds just a bit of toasty flavor to the tangy topping, and it firms things up a bit. 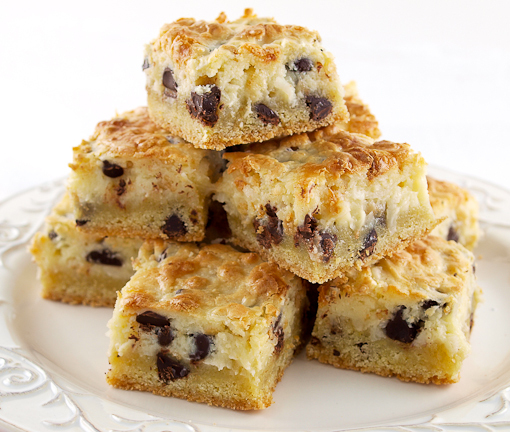 Imagine if a cheesecake and a blondie had some babies, who then rolled around in chocolate chips and coconut. That is the easiest way to explain these bars. When I was developing this recipe I made a calculation error in the topping and accidentally doubled the cream cheese while cutting the quantity of flour in half. In the great tradition of mistakes that turn out to be fantastic, I loved the resulting bar. The only issue was the looseness of the cheese topping. 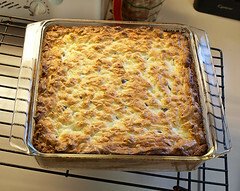 I did not want to add more flour, I did not want these to be too firm, so I added some crisp rice to the second batch. At best it would absorb some of the moisture without making things too cakey, and at worst they would make no difference. Well, it worked the way I anticipated. These are good slightly warm, at room temperature, or even chilled. 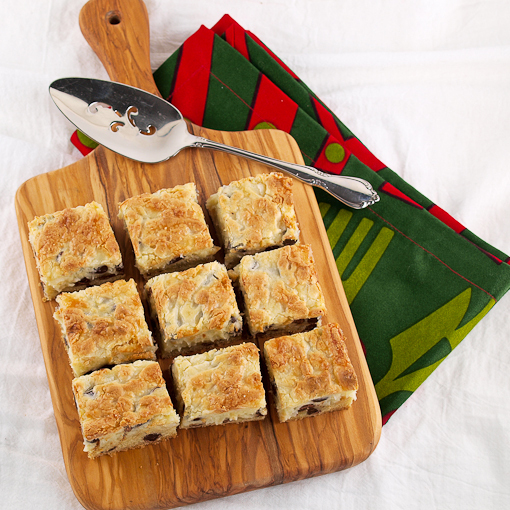 I like them best with a cup of coffee that has been generously spiked with some brandy. Hey, it’s the Holidays! Heat the oven to 350 F and spray an 8×8-inch baking pan with non-stick spray. 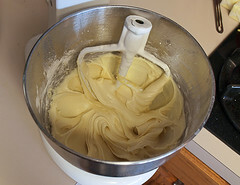 In the work bowl of a stand mixer fitted with the paddle attachment, or in a large bowl with a hand mixer, combine the flour, baking powder, baking soda, salt, sugar, butter, egg, egg yolk, and vanilla. 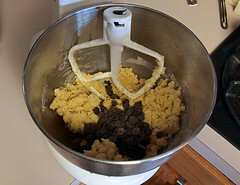 Mix until it just forms a cohesive mass then add the chocolate chips and stir until they are evenly distributed. Press this mixture evenly into the prepared pan. In the same bowl combine the cream cheese, butter, egg, flour, vanilla, and powdered sugar. 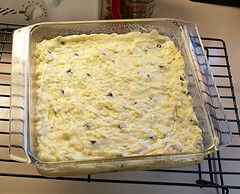 Mix until very smooth and creamy, then stir in the crisp rice cereal, coconut, and chocolate chips until well mixed.